A finish to share today ~ we have a few moments of sunshine after a week of dreary fall weather, so I rushed outside with my completed "Sleep" quilt for some photos. This post is a little photo heavy, I hope you don't mind! One explanation: on the back you'll see that I added a bright little circle of Laurie Wisburn's Brrr! fabric. It was a bit of a happy accident. I had quilted the swirls and then looked at the back and there was a very obvious flaw in the backing fabric in that spot, which I hadn't noticed before. 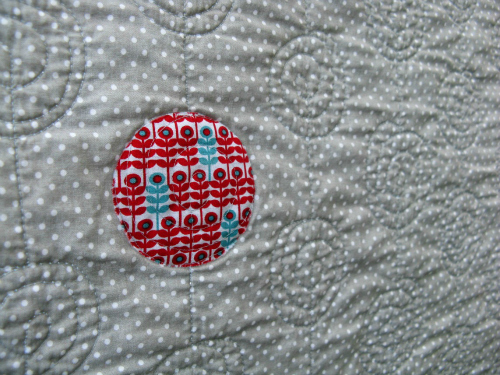 It was exactly on the spot where a swirl was so I unpicked those quilting stitches, cut a circle of Brrr! and affixed it using a sewable Heat 'n Bond product, re-did the quilting in that spot and voila! A fun little surprise on the back. 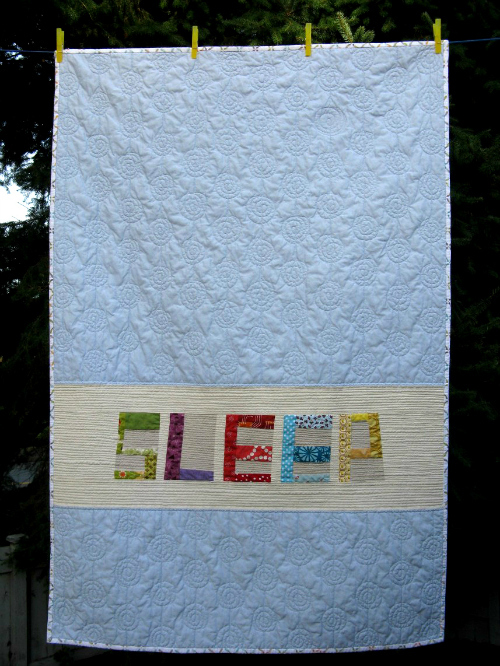 :) This quilt is now listed in my shop. Finished size: 34" x 51"
Absolutely fantastic, Heather! The quilting turned out perfectly, all of it. Love the extra little zing from the Brr! circle. Very cute. 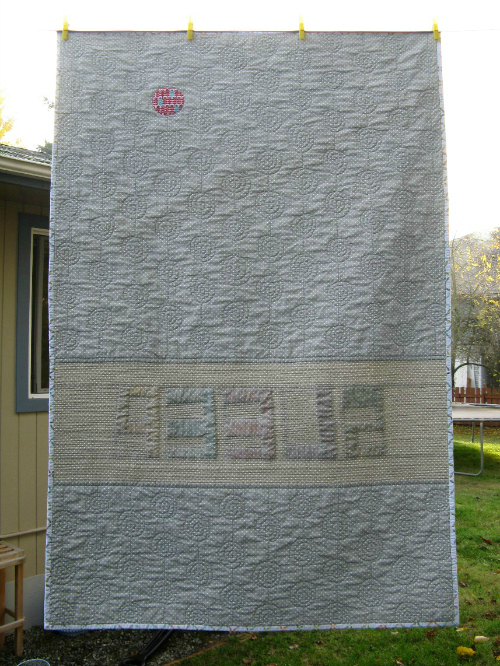 This quilting is amazing! Great job, Heather! Simply gorgeous Heather! 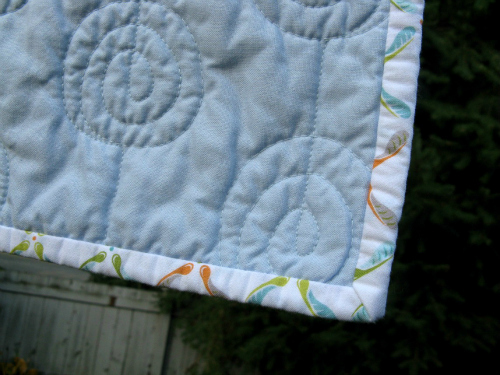 love your quilting around SLEEP and the swirls are wonderful. That little piece of Brr! is heavenly! congratulations on another great finish. I love how this turned out, especially that little circle of Brrr on the back! This is ridiculously cute. Love it. Your quilting is amazing! I love that little surprise on the back. Beautiful! the quilting is so gorgeous! Oh yay! It looks great, Heather. The quilting turned out lovely. Looking great! Love the brrr addition! Really beautiful - love the dense quilting. 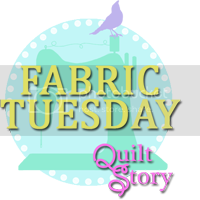 I love the colors you used for your letters and the quilting looks awesome! Great job! SO marvelous!! I love the quilting technique. It actually looks like it's part of the print on the fabric. Really great! It turned out so great - it looks cozy and inviting for sleeping, that's for sure! This quilt is so FUN! love it. It looks amazing! Your FMQ has gotten awesome so quickly! I have to agree with #19, Kate--your FMQ is amazing! This quilt is going to make a little one very happy and snuggly! The quilting really turned out perfectly! This is great! 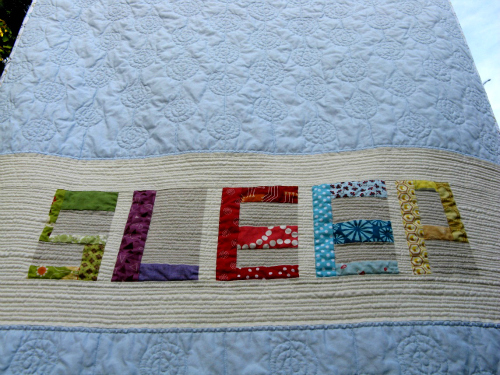 I adore your quilting around the letters - you knew exactly what they needed!! I love how you quilted this.. Great job.. Gorgeous!! I am so sorry I missed this post (what a hopeless QAL leader I am). I love the design and quilting you've done - way to go!